Hydroponic systems use a formulated nutrient mix to fertilize plants. Although nutrients are formulated in ratios that reflect the needs of the plant, transpiration and crop differences mean that nutrient levels can drift away from the optimal values. A system manager must manage the fertilizer in system water to maximize plant growth. If you have a hydroponic system, that manager is you. There are several convenient ways to test a system. Let’s learn what those are. Dr. Nate had Upstart Farmer Haydn Christensen, an experienced hydroponic farmer, walk us through the process of testing a hydroponic system. Haydn tests his system once a day. The frequency with which you test your system is especially important if your system is small, as smaller systems fluctuate more severely than large systems. The two main measurements a hydroponic grower needs to make are pH and EC levels. Both of these can be done with meters. EC is a measure of the salts in your system—that is, the level of nutrients in your system. EC should be kept between 1.2 and 2.0. EC and pH meters are affordable and often come as one dual meter. Haydn uses a Bluelab dual meter. Unless you use an RO filter together with an acidic solution, rarely will you have to worry about raising pH. It’s more likely that you will have to lower pH. While lowering pH requires several steps in aquaponics, lowering it in hydroponics is simple. You can use a pH buffer like pH Down by General Hydroponics, added to your system in a certain quantity, which is decided by how far you wish to lower your pH. If you do have to raise pH, you can use a base addition instead of an acid addition. Quick Tip: If your pH is behaving strangely or giving you difficulty, you might have a carbonates problem. You can easily lower EC by diluting your system with fresh water. Take measurements intermittently while adding water until it is mixed to the correction level. You can raise EC by adding fertilizer. Was this post helpful? Leave ideas and questions in the comments below! 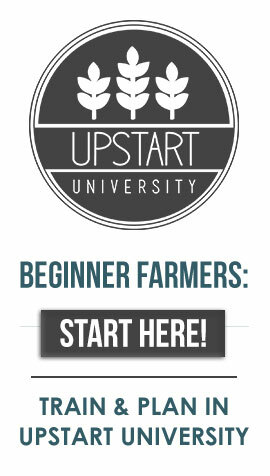 All of the information you’re looking for is available in the Upstart U courses. All you have to do is subscribe! Hi, i have dwc for growing peppers. I measure the TDS around 1600, and whenever water level drops i keep adding fresh water to keep it full. i keep measuring the TDS and it is not going down it is going up? is that normal? is the fresh increasing the TDS. my fresh water TDS is around 93. That is strange. TDS should decrease when adding fresh water. Hi Janaka. Sodium anything is generally not good in hydroponics. Try potassium hydroxide or potassium bicarbonate. It will still raise the EC some but hopefully not as much. Keep in mind that it will also increase potassium levels, so watch out for magnesium deficiencies. The base EC of my well water is a little over .8, does that mean a target fertilizer EC of 1.6 should be in addition to the base number or including the base number? I have a study from Cornell where they are calling for 1.2 “above source water EC” for lettuce seedlings so now I’m questioning all my numbers. Your target EC should be including your base EC.